If you are a parent, grandparent, pastor, or teacher looking for a way to teach the children in your life about God’s “Never Stopping, Never Giving up, Unbreaking, Always and Forever Love,” look no further than The Jesus Storybook Bible.What makes The Jesus Storybook Bible different from every other Kids’ Bible?While other Kids’ Bibles contain stories from the Old and New Testaments, The Jesus Storybook Bible tells the Story beneath all the stories in the Bible, pointing to Jesus as our Savior. From the Old Testament through the New Testament, as the Story unfolds, children will clearly see that Jesus is at the center of God's great story of salvation—and at the center of their story too. The Jesus Storybook Bible:• Visually brings scripture to life for children• Contains 21 stories from the Old Testament• Contains 23 stories from the New Testament• Presents the best-loved stories of the Bible in an easy-to-understand format• Shares how Jesus is at the center of our story• Features the award-winning illustrations of Jago• Features the beloved, bestselling writing of Sally Lloyd-Jones• Is the perfect Kids’ Bible for any age up to 6th grade For the past ten years, The Jesus Storybook Bible has been the trusted and preferred starting point for thousands and thousands of parents, grandparents, and pastors to teach their kids about the Bible. The beautiful, award-winning illustrations of Jago connect with the bestselling writing of Sally Lloyd-Jones so that the text of Scripture visually comes to life in the minds of children. 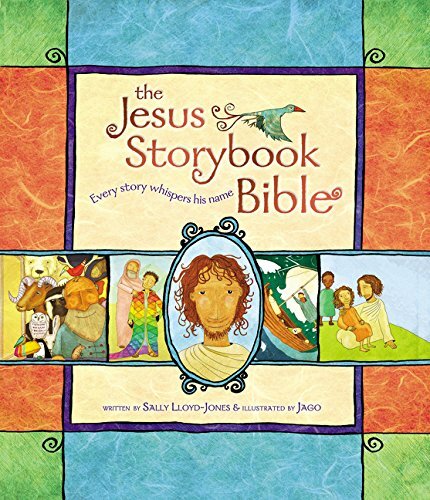 The Jesus Storybook Bible contains 21 stories from the Old Testament and 23 stories from the New Testament, presented in an easy-to-understand way that makes learning about the Bible as fun for younger children, preschool and below, as it is for older children, kindergarten to sixth grade.